ePublishing Knowledge BaseePublishing Knowledge BaseePublishing Knowledge Base Creating, Managing, and Selling Products How do I customize the confirmation email message and online order receipt sent after my customer orders for a specific product? Open the product in the Product Manager (under Sales/Marketing). 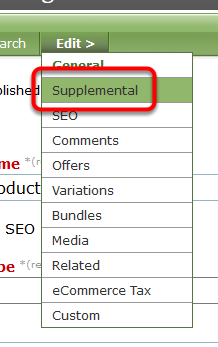 Go to Supplemental in your Edit > menu. 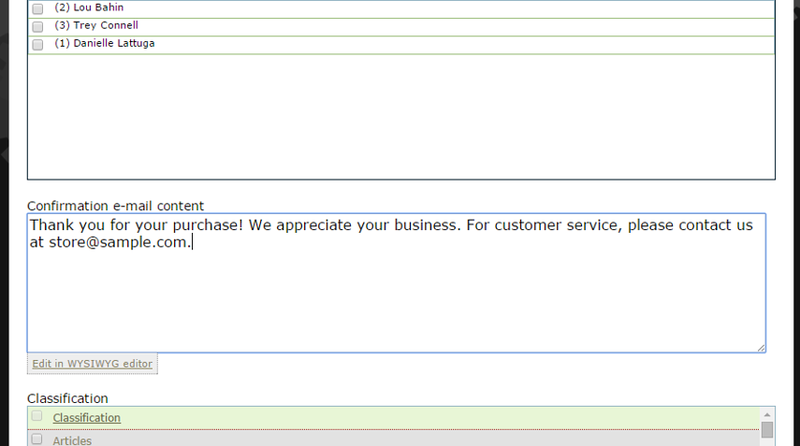 Update your confirmation email content, which will be sent along with the default receipt your customer will receive. A confirmation email will be sent to your customers immediately after purchase. The confirmation email content provides you with an opportunity to customize the messaging they will receive. The content entered here will also appear in your online receipt in your browser after purchase/registration. Zoom: Update your confirmation email content, which will be sent along with the default receipt your customer will receive. To test, purchase the product on your website. Prev: I want to have flat rates for international shipping, regardless of country. How do I do that? Next: Can I be notified if an order transaction fails? How?